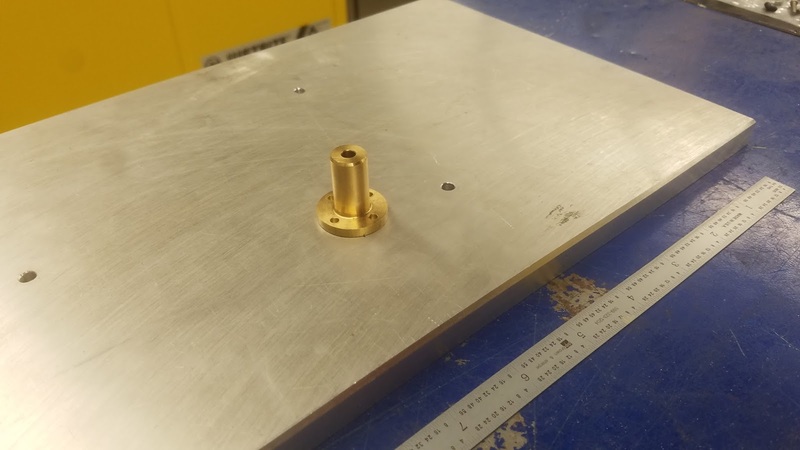 The base is a sheet of 1/2" thick aluminum onto which all other components are mounted, sized and drilled on a manual mill. The bulkhead pillars are turned on a lathe out of round aluminum stock. Next are the flywheel base and pillars. 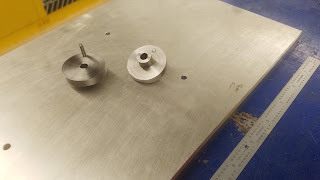 Milled out of 1018 mild steel, these pieces allow for the mounting of the flywheel. The pillars need a counterbore for the roller bearings, but at 1/2" the tooling was fairly simple. 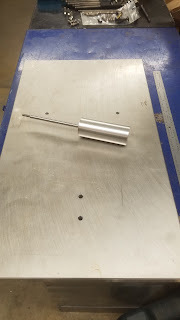 The flywheel axle is a 1/4" drill rod blank turned to length. 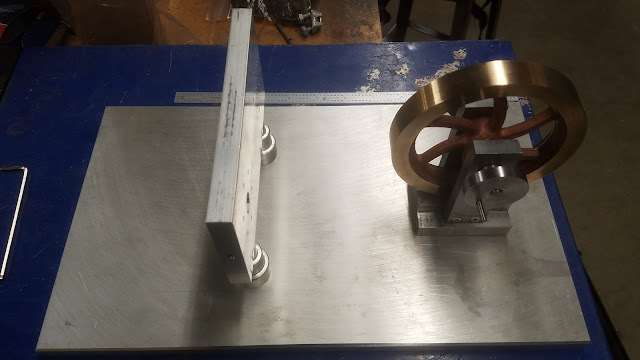 The outside diameter tolerance was already in place, so some mild sanding to get it to fit through the roller bearings was minimal effort. 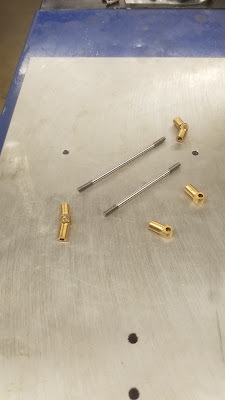 And finally are the rods that connect the flywheel cranks to the piston and displacer. 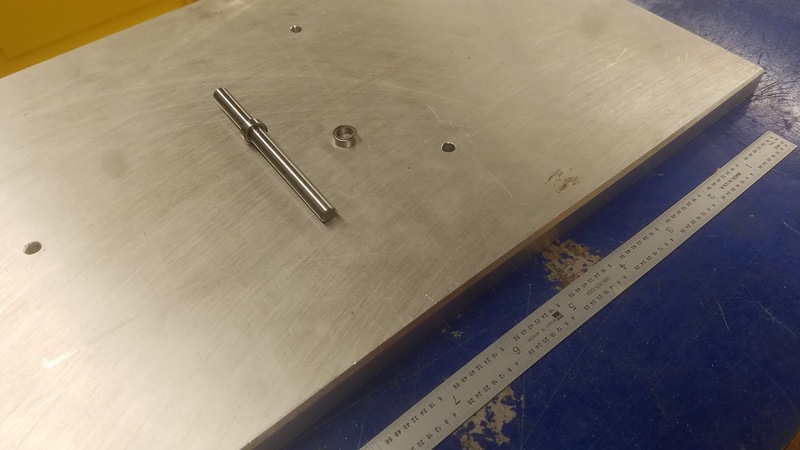 These high speed steel blanks only require outside diameter threads, turned to length. Moving on to medium tolerances, we have the cranks which turn the flywheel. 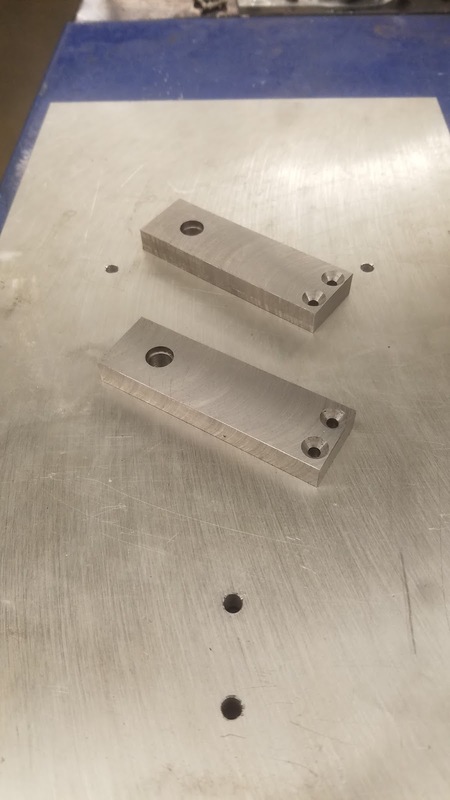 Turned from round 1018 stock, they require two reamed holes. One allows for a slip fit and set screw over the flywheel axle, and the other allows for press fit of the pins that the brass rod ends fit over. 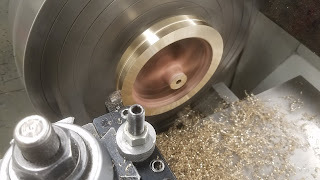 The brass piston/crank rod ends and rod/yoke ends are next. Hand tapping 2-56 was the trickiest bit. The rest of the operations were fairly familiar to me, as I've made mating joints like this for Laika Studios in the past. 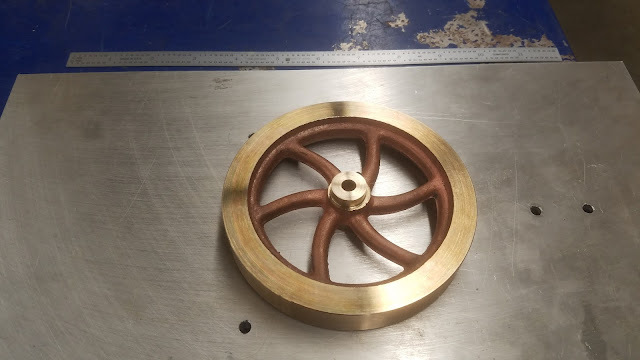 The flywheel itself was actually fairly challenging, despite only have a few toleranced features. 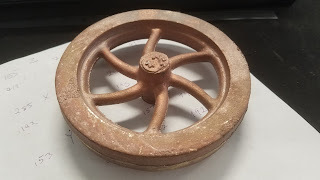 I elected for a bronze casting over a piece of round billet 1018 steel. 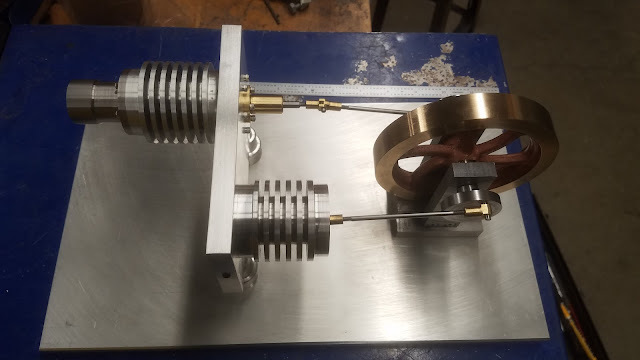 Though the setups to face and turn the casting were very time consuming, it turned out looking fantastic, and really set my engine apart from ones that other students had made. One reamed hole for slip fit onto the axle and one set screw hole to fasten it to the axle. The aluminum displacer tube is a 3 piece press fit assembly. The only critical tolerances were a press fit of the front and rear caps onto the main tube body. While a bit nerve wracking initially, the right setup had it put together in no time. 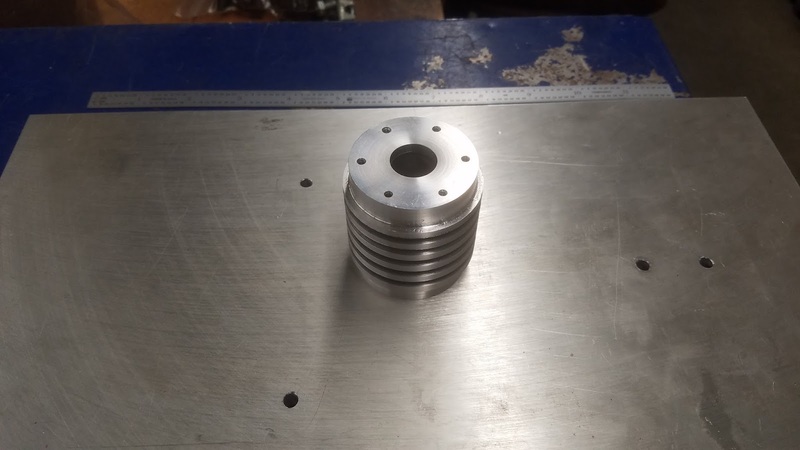 And finally the stainless steel hot cap. 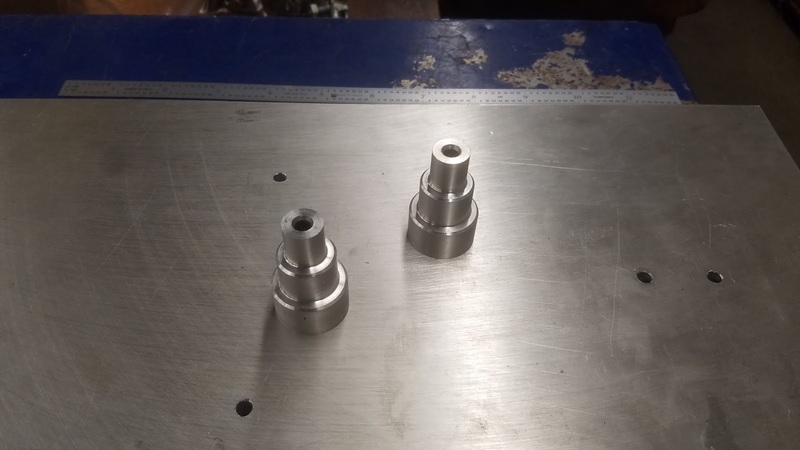 Multiple setups on mill and lathe made this fairly time consuming, but one fairly minor tolerance was the only tricky part. 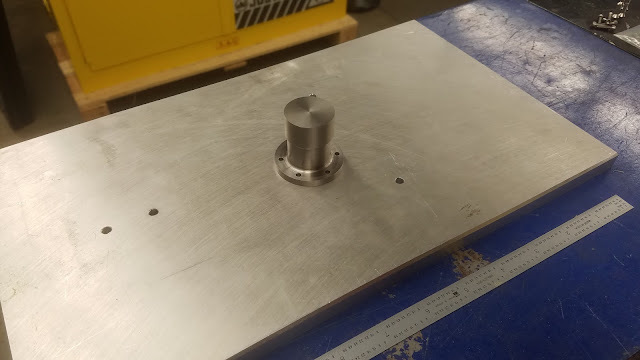 Using a hand ground High Speed Steel radius tool, I was able to get the piece looking pretty nice with minimal hand finishing. 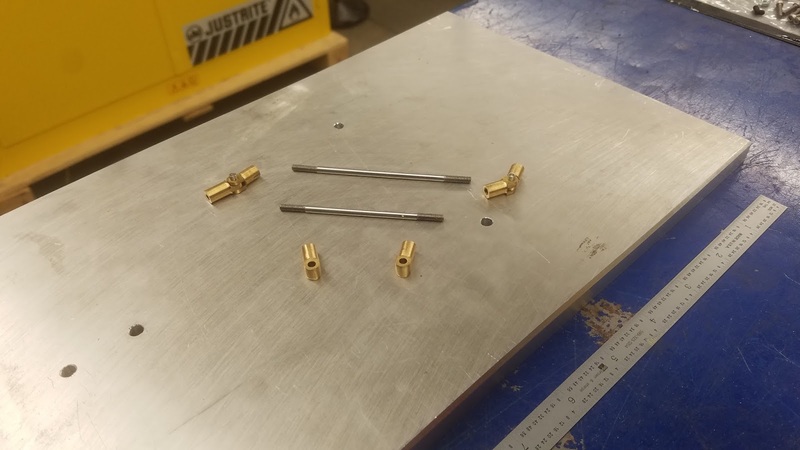 The tight tolerance pieces were all fairly involved, and required some tweaking and tuning during assembly. The brass displacer crosshead guide is a seemingly innocuous part, but ended up being quite critical to final fitment. 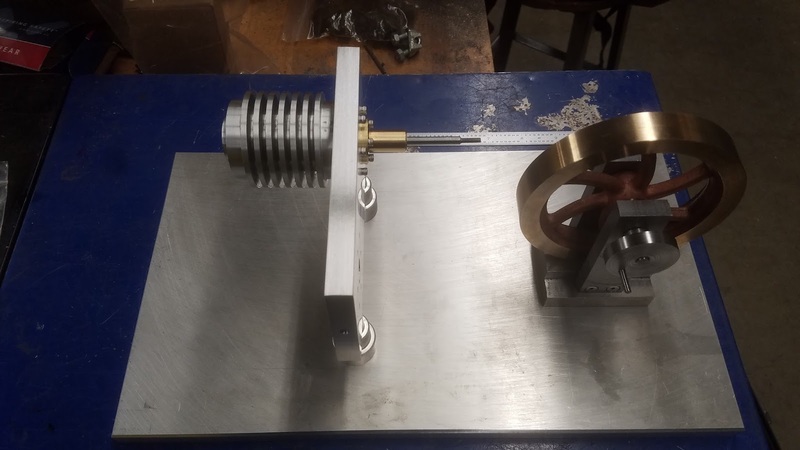 It insures the displacer tube runs true through the cylinder and hot cap. 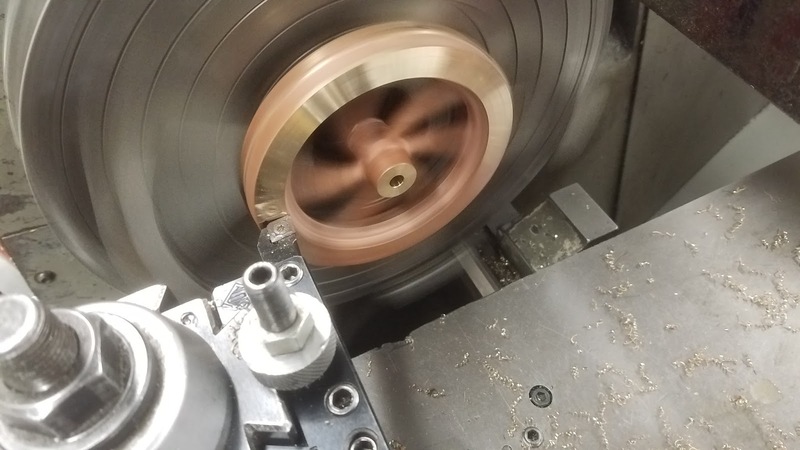 The reamed hole running its length is absolutely necessary to get right. The bulkhead, mentioned earlier, is probably the most involved part. Both cylinders are mounted to it, and it has 19 holes, 7 of them tapped, two tightly toleranced counterbores, and a side hole drilled to about 30 times diameter in depth. After all of the machining operations, it required a lot of hand finishing in order to make airtight. 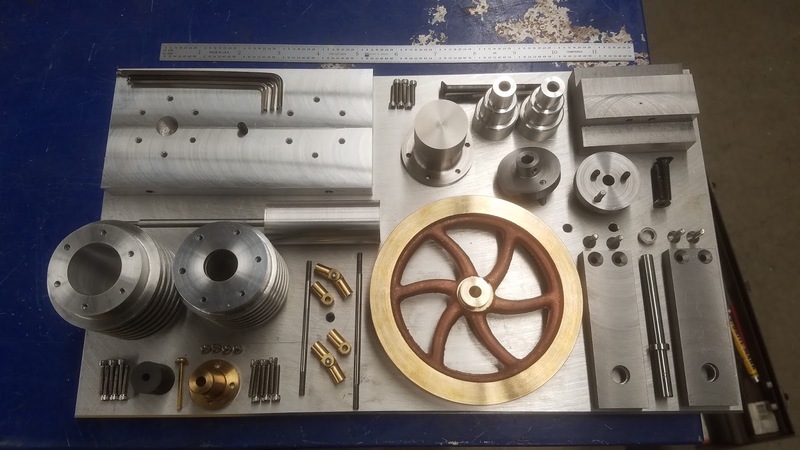 The displacer cylinder probably had the most machining operations of any single piece in the assembly. 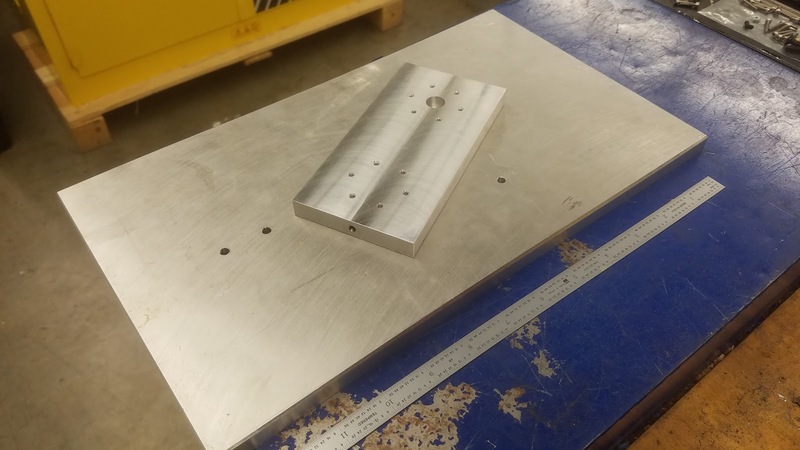 While aluminum is typically easy to machine, getting the center bore, the heatsink grooves, and two sets of 6 4-40 tapped holes machined without scrapping the part was tricky. 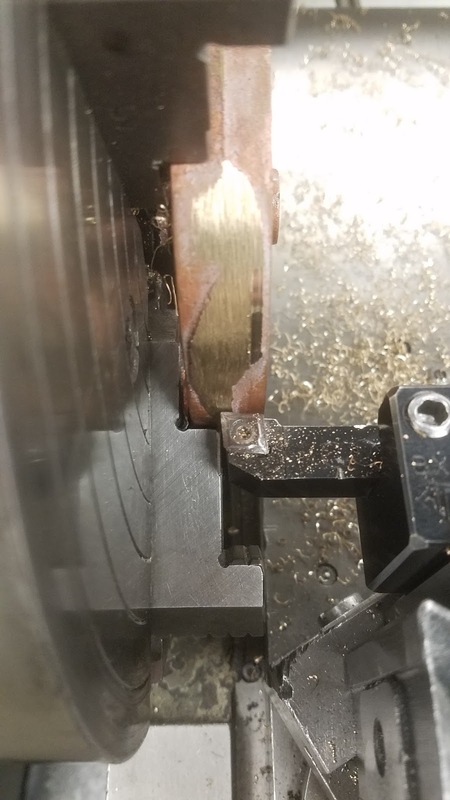 At one point, the half machined workpiece flew out of the chuck jaws on the lathe and hit the rubber guard. Safety first always pays off. This leaves the power cylinder and piston. While the power cylinder and displacer cylinder are similar, the slip fit tolerance bore made this one very time consuming. The saving grace is that aluminum machined very easily, so boring out to final tolerance without chatter marks made it simple enough to hand finish. I pushed a piece of scotchbrite into a slot I made on a thin steel bar in order to achieve the necessary surface finish in the bore. 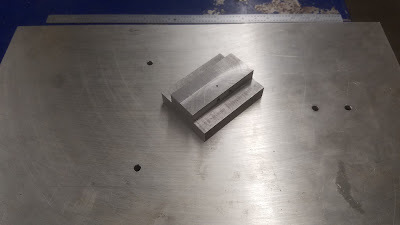 The graphite piston is the final piece to the puzzle. 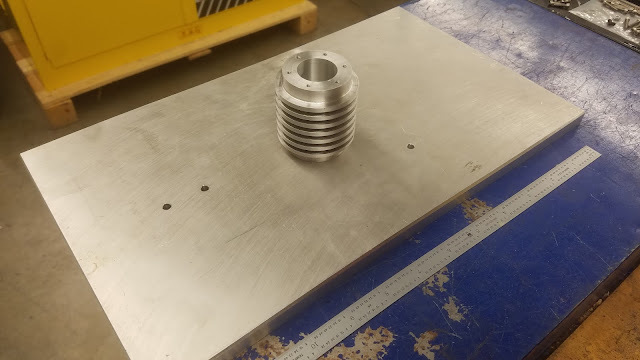 It needs to have an almost air tight slip fit into the power cylinder. Obviously graphite machines very differently from the other materials mentioned here. Of the many old, tired, and abused lathes at the shop, one of them runs true enough to hold tolerances 4 places past the decimal, and it didn't leave me stranded! 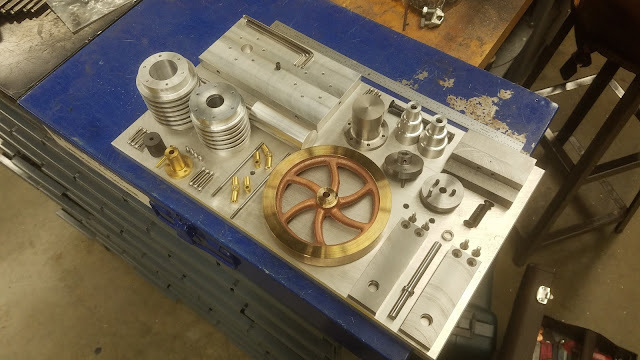 Once everything was machined, assembly started out like a breeze. 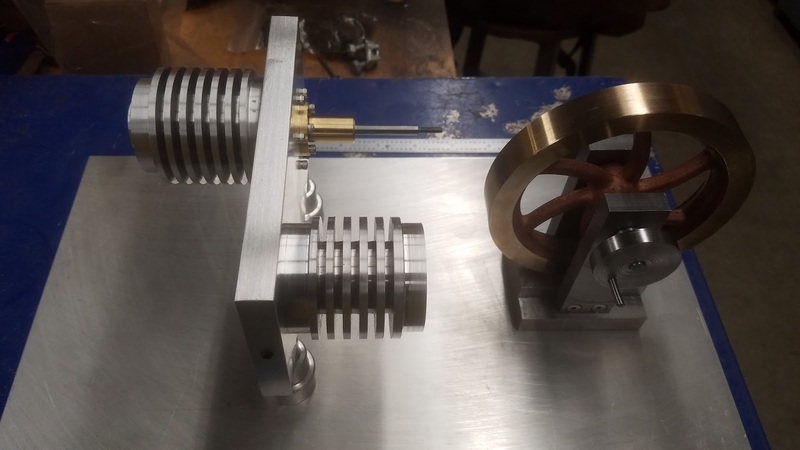 The flywheel assembly snapped together no problem, and the bulkhead looked like everything was in order until the displacer assembly. 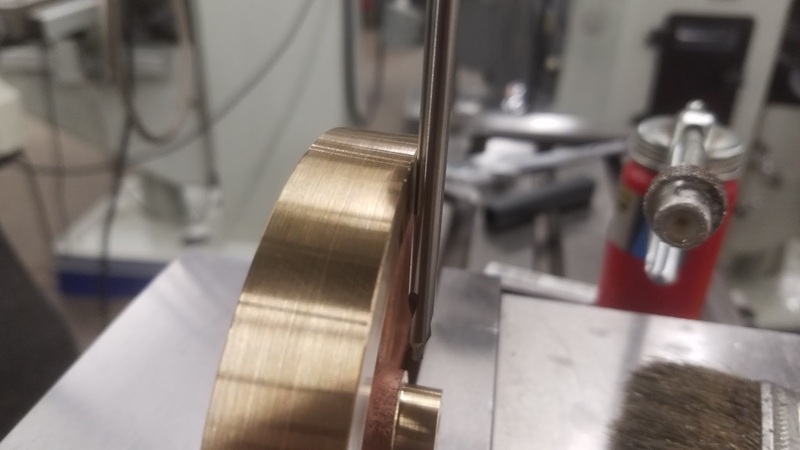 There are enough stacking tolerances in the tenths place (.0001) that it started to bind up. 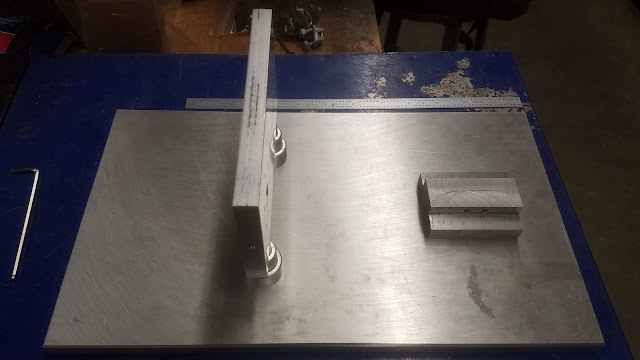 After making some minor adjustments, cutting out and installing the insulator, and lubricating critical surfaces, it was time to test everything out. No dice. Didn't turn. 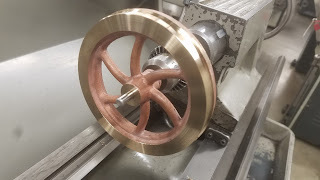 Getting the hot cap cherry red still didn't displace enough air to keep the flywheel cranking. A complete disassembly of the bulkhead assembly and a few hand finishing and sealing operations later, we were in business. 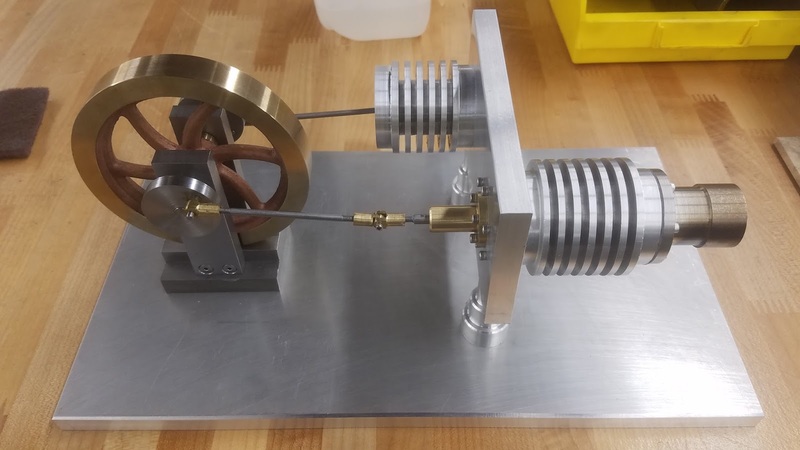 Due to the tiny displacement of the engine, any air leak will drop the power to a place where the flywheel just can't turn. 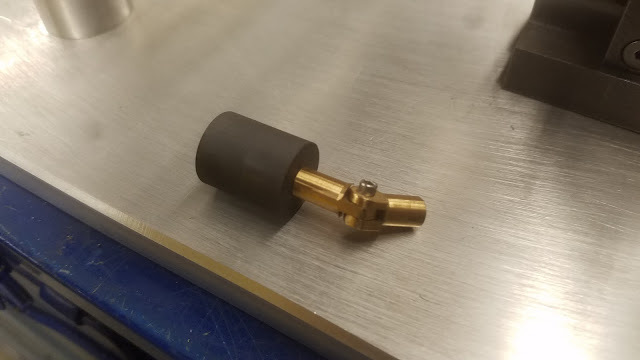 RMS 32 surface finishes and a heat resistant sealant plugged them up and got it turning first try. Because the flywheel is cast, it is slightly imbalanced. I'll have to remedy that if I want the engine to run long term without rattling itself to pieces. 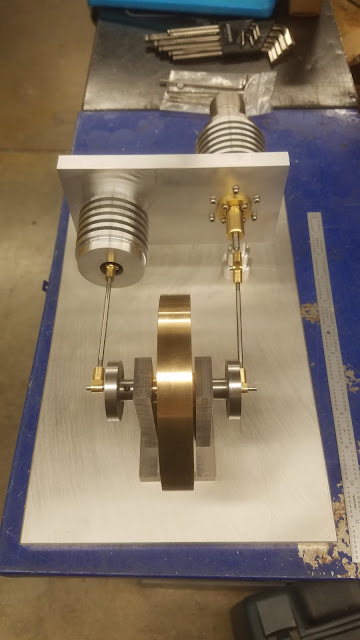 It runs very smoothly part from that. A little rust preventative on the mild steel pieces, and it should stay nice and shiny for a long time. 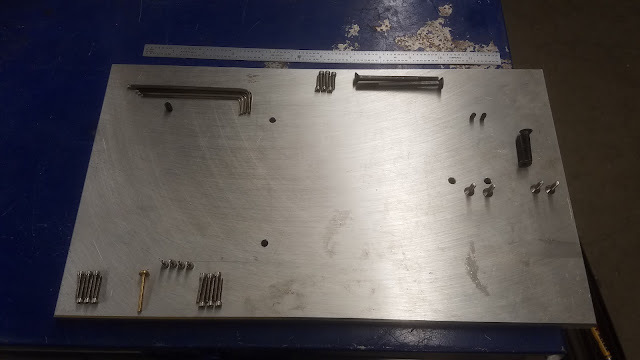 I may eventually replace all of the black oxide fasteners with stainless hardware. All in all a very fun and educational project. 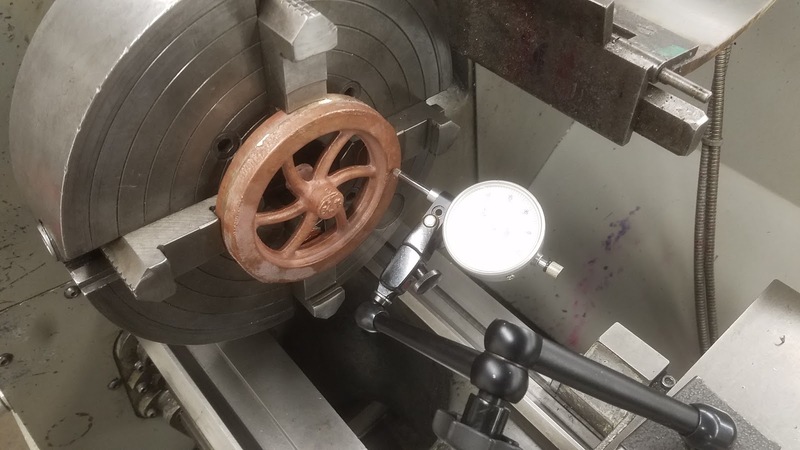 I'm much more confident on manual machines, and my setups are safer and more accurate because of it. Cool! Do you have any video?